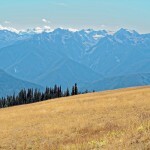 The annual transition from winter to spring brings many changes to our Earth. Some of them are easily noticed. The days become longer. Migratory birds start to arrive from their wintering grounds farther south. The branches of willows acquire a fresh yellowish blush. Soon the earliest flowers open, and pollinators start to flit about. These are changes that we can readily see, but there is much going on at the same time that we cannot see. Among the hidden processes that occur in the deciduous forests of the Upper Midwest, the Northeast, and many parts of Canada is the extravagant production of the sweet sap of sugar maples (Acer saccharum, Family Sapindaceae) and a handful of other tree species. 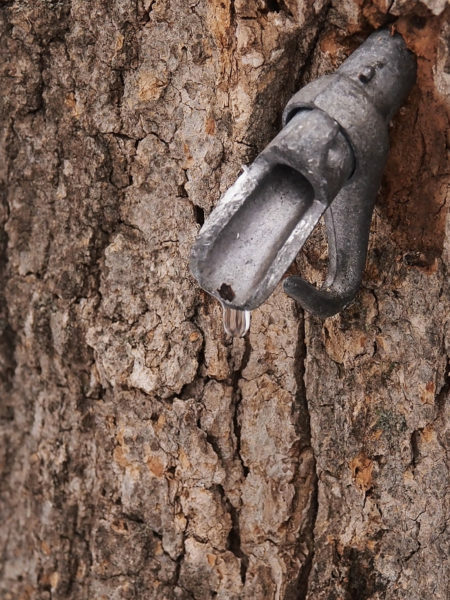 We use this sap to make one of North America’s favorite products, maple syrup. 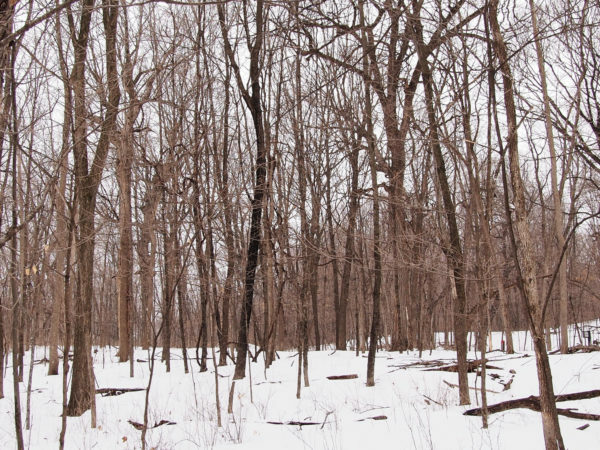 As winter turns into spring, the appearance of a sugar maple-dominated woodland, a sugar bush, provides no hint that major changes are taking place under the trees’ bark. 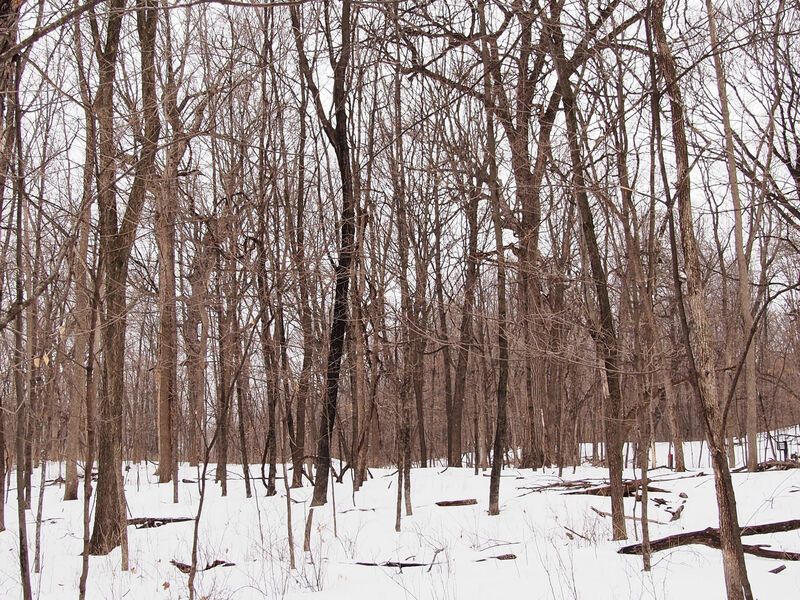 There is snow on the ground and the trees are as barren of leaves as they were all winter long. But sugar bush owners and managers know better, and they start setting up their sugaring operations. Take, for example, the sugar bush shown above, at the Eastman Nature Center in Minnesota. 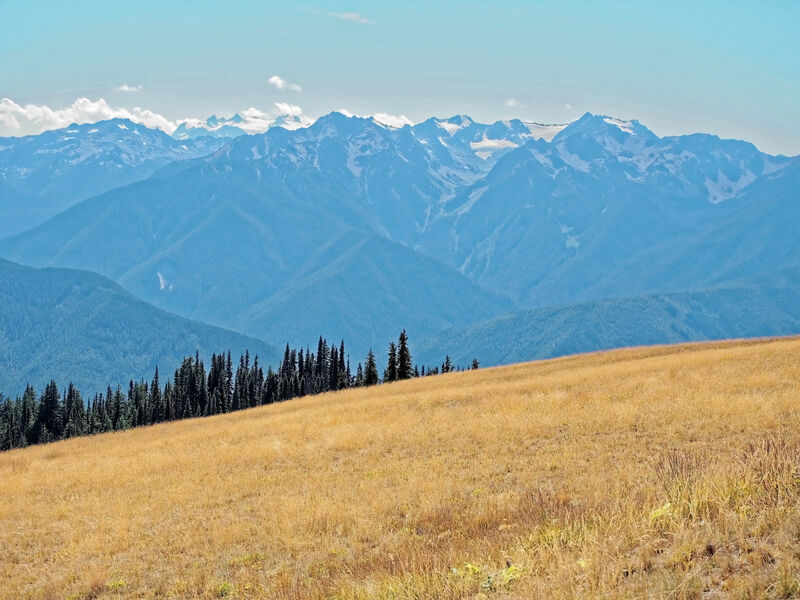 The stand consists mostly of slender, young trees, but scattered throughout are individuals more than 200 years old—trees that took root around the time of the American Revolution. Trees that are not too young and not too old are the most likely to produce large quantities of sap. They are upwards of ten or twelve inches in diameter. At this time of year they are ready for tapping. 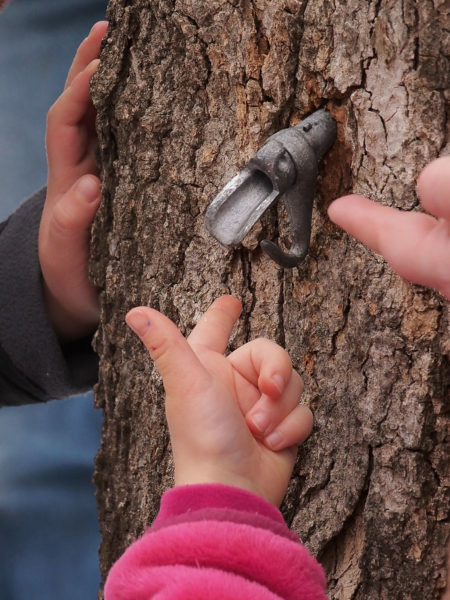 The canister you see in the photograph above is collecting drops of sap from such a tree. It will be emptied periodically, and the collected sap turned into syrup. The main purpose of the canister’s roof is to keep falling snow from diluting the accumulated sap. The small metal disc, at about one o’clock above the canister, is stamped with a number identifying this particular tree. Each year managers at the Nature Center select just forty trees in the sugar bush for tapping, rotating the harvest so that each tree is maintained in prime producing condition. The sugar bush of a commercial producer, on the other hand, may consist of thousands of trees. The sap can be collected in another way, illustrated above. 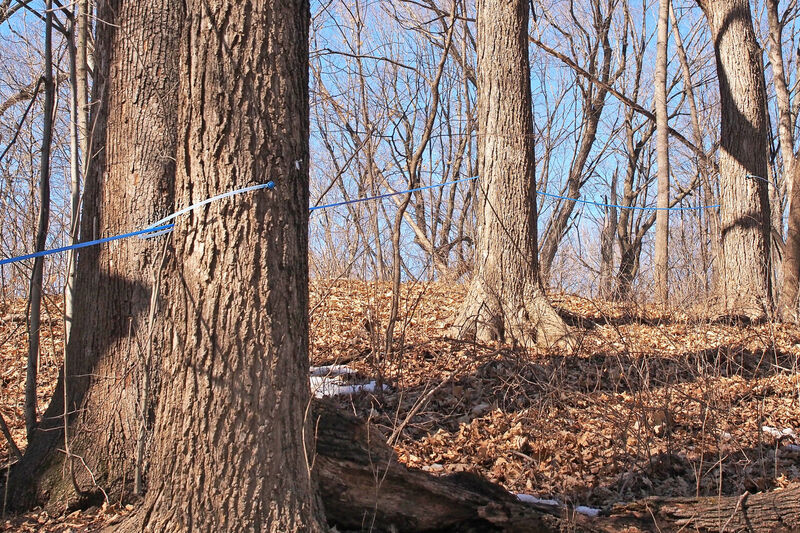 The slender blue line you see is plastic tubing that is collecting sap produced by several trees, conducting it downhill by gravity feed, and depositing it in a large container situated on a convenient trail at the base of the slope. Such systems can be made quite extensive and complex and the flow of the sap in them can be aided by applying a vacuum. They save the labor of collecting sap individually from multiple trees. WHERE DOES THE SUGAR IN SAP COME FROM? Fresh sap is sweet, though only moderately so. But here’s a conundrum. Green plants produce sugar through the process of photosynthesis, driven by light energy from the sun. But photosynthesis depends on the chlorophyll pigment found in green leaves, and, as the photographs show, at this time of year the trees that are already producing sweet sap have no leaves at all. So, where does the sugar in the sap come from? The sugar in sap comes primarily from cells in the roots and also in the trunk. This is where the sugar was stored, mainly in the form of starch, the previous year while photosynthesis was still in full swing. Sugar molecules, synthesized in the leaves, were delivered downward by the conducting system called the phloem, a thin layer of cells situated between the wood (the xylem) and the bark. With the help of appropriate enzymes, cells in the roots and, to a lesser extent, the trunk stitched the sugar molecules together into long starch molecules. When it becomes time for the sap to run, the starch molecules are unstitched and the released sugar molecules are made available for transport upward into the branches. Whereas sugar molecules traveled downward from the leaves to the roots via the phloem, they travel back upward in the outer layers of the xylem, often called the sapwood. All sap is mostly water. A tree gains virtually all of its water through the roots. Up in the canopy, water molecules escape in large numbers from the leaves, a process called transpiration. This generates a physical pull on the water still within the tree and thereby draws it upward. 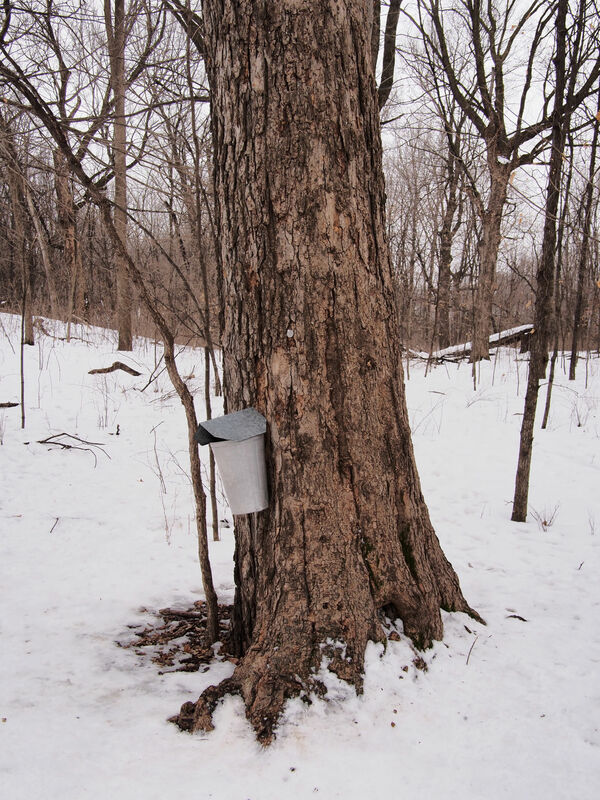 During sugaring season, however, when sweet sap is flowing most actively, a sugar maple’s leaves have not yet come out and its sap cannot be pulled upward by transpiration. What, then, makes the sap flow? A clue to what is happening is provided by the observation that sugar maples at this time of year develop a substantial internal pressure that can be measured by a simple pressure gauge. Below is an example from the Eastman Center. The probe on the left has been inserted into the sapwood, and the associated gauge on the right reads 12 pounds per square inch (psi). 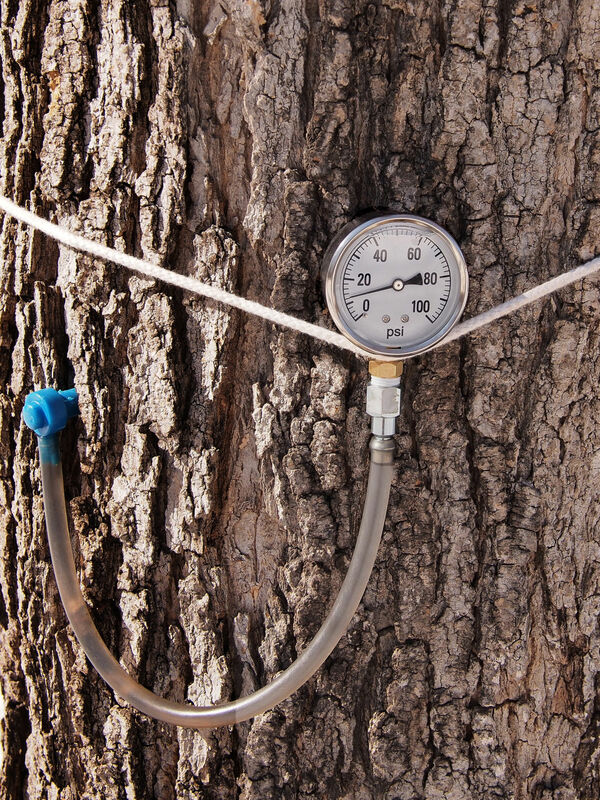 Pressures in the range of 20 to 40 psi are common in sugar maples during the peak of the sugaring season. For comparison, the pressure inside a typical car tire is around 30 psi. In the presence of internal pressure, sap is forced out of any hole that reaches into the sapwood. For sugaring, the sapwood is reached by drilling, like in this family-oriented demonstration also at the Eastman Center. Escaping sap looks like this. The rate at which it runs is highly variable, but about one drop per second at the tip of the spout (often called a spile) is pretty common. And here is a young assistant eager to catch the next drop on her fingertip! You can watch sap dripping in real time here: https://youtu.be/i-BsqwTyleM. WHAT GENERATES THE TREE’S INTERNAL PRESSURE? The internal pressures generated by sugar maples, as well as several other tree species from which sap is collected during sugaring season, are high compared with those in species that do not produce abundant sap suitable for sugaring. These high pressures depend both on the disassembly of starch molecules into sugar molecules and on the prevailing temperature regime. Every owner of a sugar bush is keenly aware that a succession of freezing nights and warm days produces the greatest flow of sap. 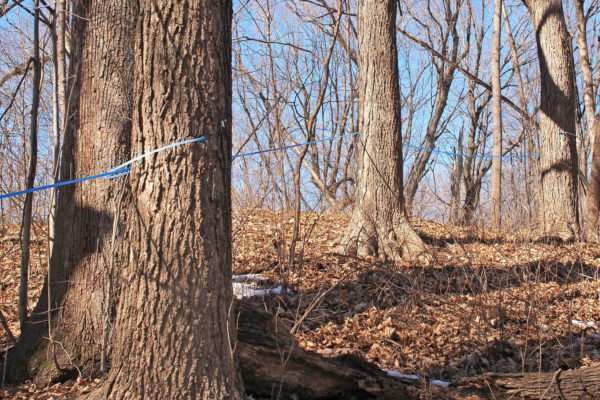 Why at least two quite different factors—increased sugar concentration and alternating freezing and warm temperatures—should be required for abundant sap flow is a question that is both scientifically intriguing and commercially important. The available answers, however, depend on rather complex physics. We’ll explore the current ideas in another post. WHAT GIVES MAPLE SYRUP ITS FLAVOR AND COLOR? Maple syrup is derived from the sap of living trees, and that sap contains many chemical components. Some of them were synthesized by the trees for their own use, others entered the roots from the soil, and still others were synthesized by microorganisms living in or on the trees’ tissues. In short, even the starting material for maple syrup is highly complex and contains a diversity of organic molecules and minerals. During the collecting of sap and its processing into syrup, this already complex material is modified by many chemical reactions driven both by bacterial action and by heat. The final syrup is indeed a symphony with many players! Let’s look at what some of these are. Sugars—The sugar molecules generated by photosynthesis in a tree’s leaves are glucose, a simple sugar that does not circulate much in the rest of the plant. Rather, most of the tree’s glucose is quickly converted either to a different but closely related sugar, fructose, or to starch. When one molecule of glucose and one molecule of fructose are chemically joined, the result is sucrose, table sugar. All three sugars—glucose, fructose, and sucrose—are widely though unequally distributed in plants and taste much the same. Maple sap is particularly rich in sucrose, which can make up as much as 98% of the sap’s total sugar content. The amounts of glucose and fructose are far smaller. Other organic compounds—Many additional organic compounds are present in maple sap. These include organic acids (among them malic acid, oxalic acid, and citric acid), and a variety of vitamins and amino acids (the constituents of proteins). Minerals—Tree roots absorb many minerals from the soil, and these find their way into sap. Among them are potassium, magnesium, calcium, manganese, and phosphorus. Flavor and color—The final step in the conversion of maple sap to maple syrup is always the process of heating the sap to drive off water. As the sap heats, complex chemical reactions that involve not only the sugars but also many of the other compounds present in sap take place. It is said that the final product, maple syrup, contains hundreds of compounds that contribute to its taste and its color, most of them generated during the processing of sap to syrup. Despite flavor and color being of great importance to the producers of maple syrup, a comprehensive understanding of all the reactions that occur and all the products that accumulate during processing is not yet available. Illustrated below a traditional way of finally making syrup out of sap, boiling it in a cauldron, as practiced at the Eastman Nature Center. Just imagine all the chemistry going on! And here is what the boiling looks like in real time: https://youtu.be/haxhSZX5Ec4. Notice how, about half-way through the video, the swirling steam suddenly reverses directions. How do you suppose this might happen? What does it take?—Heating water takes a tremendous amount of energy and evaporating it takes even more. About 4 gallons of fuel oil are required to produce a single gallon of maple syrup! From an environmental point of view this means the release of a significant quantity of greenhouse gases, and from an economic point of view it means a significant expense. No wonder maple syrup is expensive and producers are always looking for less energy-intensive ways of making their wonderful final product! 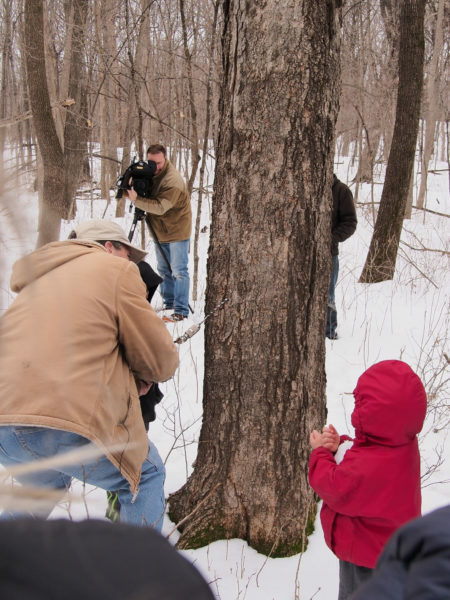 Whenever you have the opportunity to visit a sugar bush, recall the various processes that lie behind the maple syrup we enjoy—photosynthesis to make the sugar; biochemical reactions to convert sugar to starch (to store chemical energy) and then disassemble the starch back to sugar (to make the energy readily available for metabolism); the movement of sap through the xylem of the tree; the generation of pressure that forces the sap outward; and, finally, the collecting and processing of the sap to make syrup, including all the chemical modifications that take place as this is being done. And whether or not there is a sugar bush in your vicinity, when you see a bottle of maple syrup, or taste a few drops, recall these same processes. 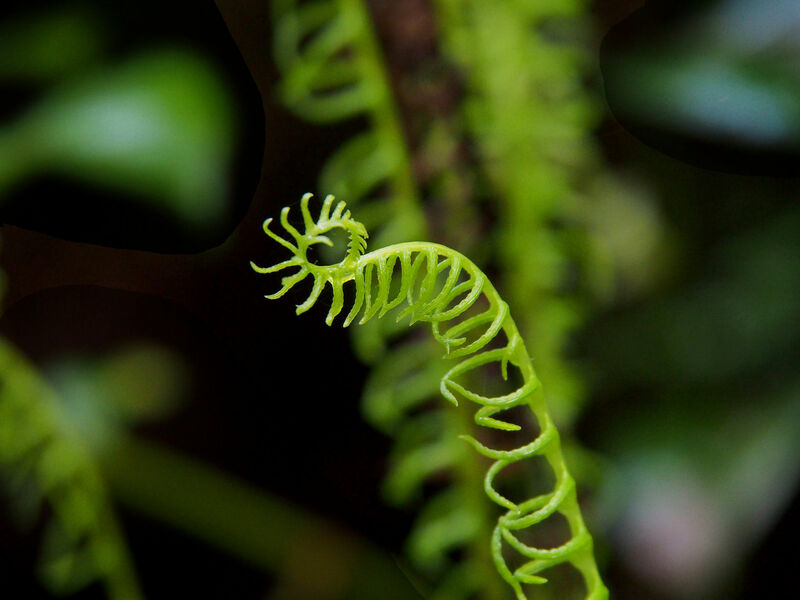 They illustrate well the complexity of life on Earth, a complexity that we humans fully share in but appreciate only if we stop to remember it and make an effort to understand it. 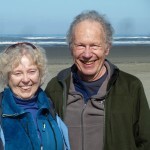 Just got a small jar of maple butter at a local specialty store here on the Oregon coast. Now I know more about maple sugar processes. Thanks for the lesson! And maple butter does not contain any butter at all! Thanks, Ursula. That’s high praise indeed, and much appreciated. 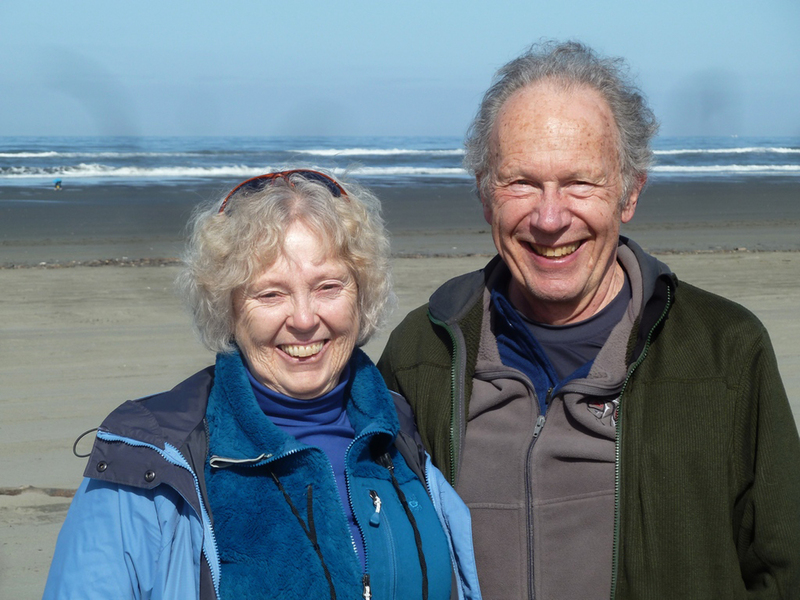 Thanks, John, for your accessible description(s) of complex plant life. It adds some texture to my walks in the woods. Regards the vacuum tubes that increase maple syrup production: I’ve often wondered how it wouldn’t be over stressing the trees over time. Perhaps you’re implying it doesn’t. But I’m glad for the small operations such as at the Eastman Center. Even here in quaint old Vermont the tubing abounds this time of year. From what I have read, overstressing is not known to be more of an issue with vacuum systems than it is with simple drip systems, but I could easily have missed something. I can easily imagine, however, that stress could be a factor if a given tree is tapped every year rather than on rotation as they do at Eastman, or if a vacuum is applied for a long time in a year when the flow of sap is low. Good analyses on this point are probably available; if I come across one, I will add a comment to the post. I have read the argument that burning wood (not a fossil fuel) is carbon-neutral, IF one sustains a woodlot from which the small percentage of fuel is drawn. Thoughts? 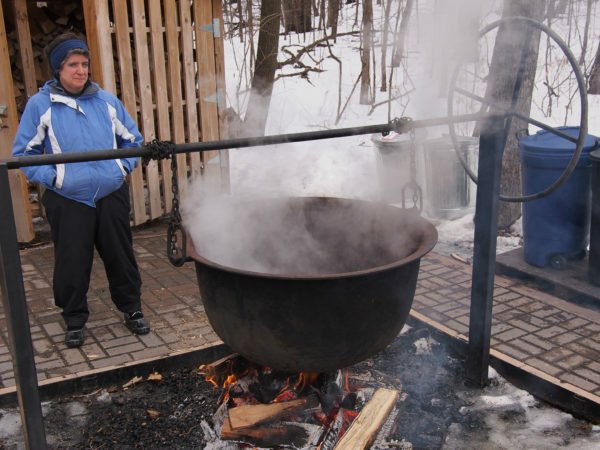 The farmer I knew in upstate NY who made 200 gallons of maple syrup ever year, boiling with the prunings he gathered from his sugar bush all year long. I, too, have read about this idea. One component of the argument needs to be the efficiency of heat extraction from the wood. Apparently there are wood-fired systems in place in the Scandinavian countries whose burners operate at uncommonly high efficiency, are located centrally and distribute the heat to the nearby community with little loss, and also draw their wood from local sources managed for the purpose so that there is little carbon cost associated with transporting the wood. If the details are attended to, then carbon neutrality can be achieved. At least, that is what I remember reading a few years ago. Hi John. Thank you for a wonderful article. I get my supply of maple syrup from Canadian friends visiting me here in Ireland. (only reason I let them stay) I do like maple syrup but I have no idea about quality or taste difference in the syrup. I there an index system of quality, like in the wine world? Does the terroir effect the taste? Asking in half jest as the next guests from Canada might be asked for a bottle of maple syrup equivalent to a bottle of Chateau Petrus. I always look forward to your articles. Fascinating–and complex! I’ve been using drops of maple syrup often now as a sweetener on morning oatmeal after reading this. 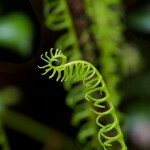 Living things have such ingenious systems for moving liquids around for all kinds of life-sustaining purposes.